Induction cooking requires the use of a certain type of cooking vessel. The bottom has to either contain iron or have a layer in the base that has magnetic materials. 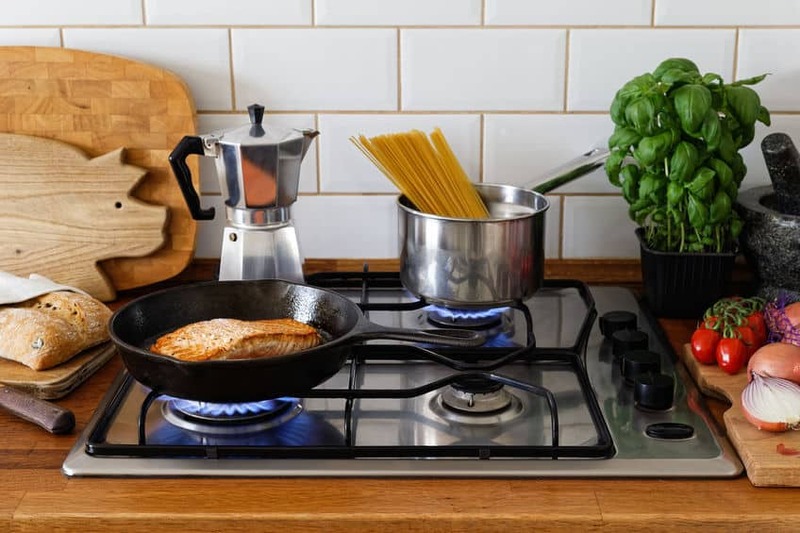 This is due to the fact that induction stoves have a different heating system than conventional electric or gas stoves. Induction appliances have an electromagnetic coil under the surface of the cooktop. When the unit is turned on, an electric current flows through this coil producing a magnetic field. When induction compatible cookware is put on the cooktop, this magnetic field generates electric currents in the metal of the cooking vessel. The pot or pan then acts as a heat source and transfers the heat to the food. Enamel cast iron, cast iron, steel, and stainless steel pots and pans with a magnetized base are induction ready. Glass, all-copper and aluminum won’t work with induction stovetops unless there is an added layer on or in the base that has magnetic properties. 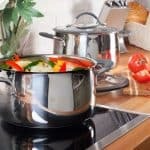 Today, many manufacturers add magnetic materials to the base of their cookware, but older pots without magnetic materials won’t work. 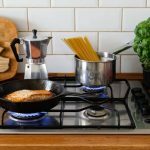 It is fairly simple to work out if your pans and pots are induction ready or not. Place a magnet on the base of your pot or pan. If it sticks securely to the base, it is induction ready and can be used on your induction cooker. If it is attracted to the pot or pan, but doesn’t stick firmly, it may work, but will probably have a low efficiency level. If the magnet has no pull toward the base of the pot or pan, then it doesn’t have the metals needed to create heat with an induction cooker. Hint: A regular refrigerator magnet is perfect for testing induction readiness. Before you head out to buy your induction cookware, grab a magnet from the fridge to test different pans and pots. 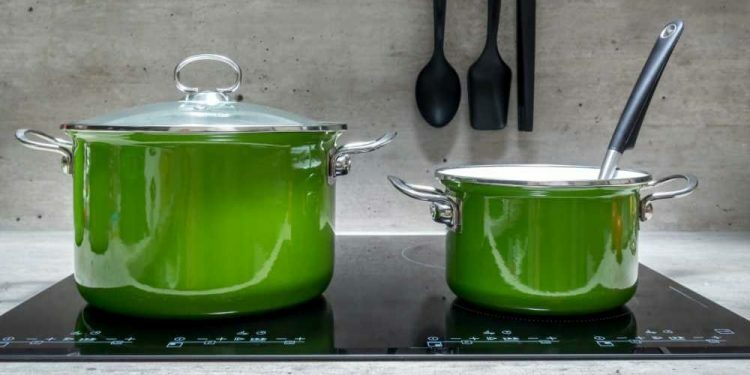 Most of the time, you won’t need the magnet as many manufacturers now state whether a cookware item is induction compatible by placing a symbol (which looks like a coil or a zig-zag) on the base of the item or it will state so on the product’s packaging. If you don’t have a magnet, another way to check is to pour a little bit of water into the cookware item and place it on the induction cooker. If the display flashes an error message, the pot or pan is not induction ready. Cookware that works on induction cooktops usually works on gas, electric, radiant, and smooth cooktops. This information is available in the product descriptions. It is handy to have cookware that can be used on a various heat sources. Thanks to induction cooking becoming more popular over the last few years, more induction ready cookware is available. If you have an induction cooktop or plan to purchase one, you have a couple of options. The first is to purchase the best induction cookware set and/or individual pieces you can afford. The second option is to make a list of the type of cooking vessels you need and then test and examine the pots and pans you have to determine if they are induction ready. A short list of cookware would include a saucepan, cast-iron skillet, dutch oven, and a non-stick frying pan/skillet. After you test your cookware with a magnet (it should stick securely to the bottom), examine the base of your induction ready pieces. Ideally, it should be smooth and flat. 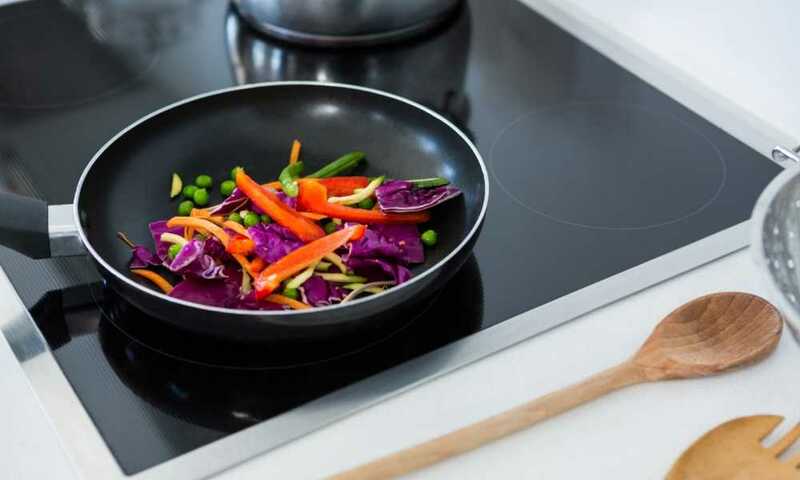 However, if it is warped a little, it might still work on your induction cooktop if you place a damp cloth or paper towels underneath the pan. This will stabilize it and also keep any oil/fat from sliding to one side of the pan. 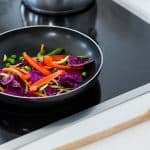 Now that you know which pieces will work with your cooktop, you can compare that list against the items you need (some people like to have a sauté pan, stockpot, and casserole pots as well). Now, you have a list of items to purchase. Depending upon your list, it might be more cost effective to buy the pieces separately. In the end you might decide to buy all new cookware. In that case, the decision becomes one of whether to buy a cookware set or individual pieces. Steel is an alloy with the major element being iron. Other elements such as carbon, manganese and nickel are present in trace amounts. Stainless steel has a minimum of 10.5 % of chromium (of the alloy's mass) and is known for its corrosion resistance which improves as the amount of chromium increases. There are different formulations of stainless steel. The two main types of stainless steel: austenitic and ferritic. The atomic arrangement in austenitic steels renders them not magnetic. Austenitic steels contain chromium, nickel and iron. Other alloying elements are added to produce certain grades of steel. The way the atoms are arranged in ferritic steels, allow them to be magnetic when subjected to a magnetic field. Ferritic stainless steels consist of chromium and iron. They are induction ready as they are ferromagnetic and essentially nickel free. Stainless steel is sometimes described in terms of numbers such as 18/10, 18/8 and 18/0. The numbers refer to the percentage of chromium and nickel respectively. Stainless steel with no nickel (18/0) is magnetic because nickel changes the structure of stainless steel making it non-magnetic. Sometimes the grade is stamped on the bottom. If not, check the product description. A pot that only has one layer of stainless steel, won't conduct heat very well and would be prone to warping and denting. Each additional layer increases the pan weight and thickness and improves the thermal conductivity. The thicker the base, the greater the distance between the heat source and the surface of the cookware. This is helpful because by the time the heat gets to the cooking surface it will be more evenly spread out. A good pan will have some weight to it. The food will cook more evenly, the chance of dinging it are less and it is more durable. If you are purchasing cookware online, check the reviews, people generally comment on the weight of pots and pans. Cookware product descriptions often use terms such as aluminum or copper core. In terms of cookware, core refers to the disc on the base of a pan. This disc of aluminum or copper is sandwiched between other layers of steel. Since stainless steel is a poor heat conductor, a metal that conducts heat well, such as aluminum is often placed between two layers of stainless steel. Cookware is also available with a copper core. Since copper is a better thermal conductor than aluminum, pans with a copper core react more quickly to temperature changes. An example of a 3-ply stainless steel induction pan has an aluminum core sandwiched between of magnetic grade stainless steel (exterior) and another layer of stainless steel (interior). The term "ply" is a reference to the layers of materials used in the manufacture of the bottom and sides of the cooking vessel. Each layer has a purpose. Stainless steel is resistant to corrosion and magnetized stainless steels makes the vessel induction compatible. Copper and aluminum are good thermal conductors (copper is better). An example of 3-ply induction cookware is an exterior layer of magnetized stainless steel, aluminum core (center) and an interior layer of stainless steel. In terms of cooking, cladding is a manufacturing process where a thermally conductive material such as aluminum or copper is covered with a non-reactive material such as stainless steel. The aluminum or copper covers the base and sides of the vessel. This allows heat to be more evenly distributed. Multi-clad cookware contains layers of different metals. The number of layers can be 3, 5, or 7 and be referred to as "multi-clad". These layers are on the base and extend up the side of the vessel. One example of 3-ply construction is an aluminum core (aluminum is in the center) surrounded by stainless steel. Aluminum is a very good heat conductor and distributes heat evenly across the pan. 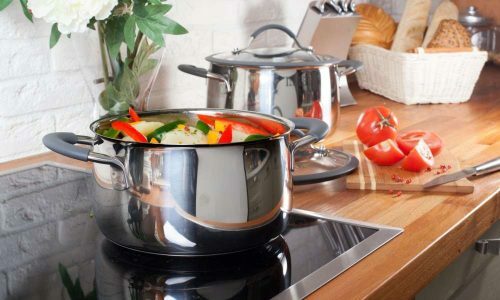 Induction cookware has a magnetized stainless steel exterior. The grade of stainless steel on the cooking vessel interior differs according to brand and product. Other 5-ply pots and pans have alternating layers of stainless steel and aluminum. This insures even heating and greatly reduces the chance of your vessel warping. 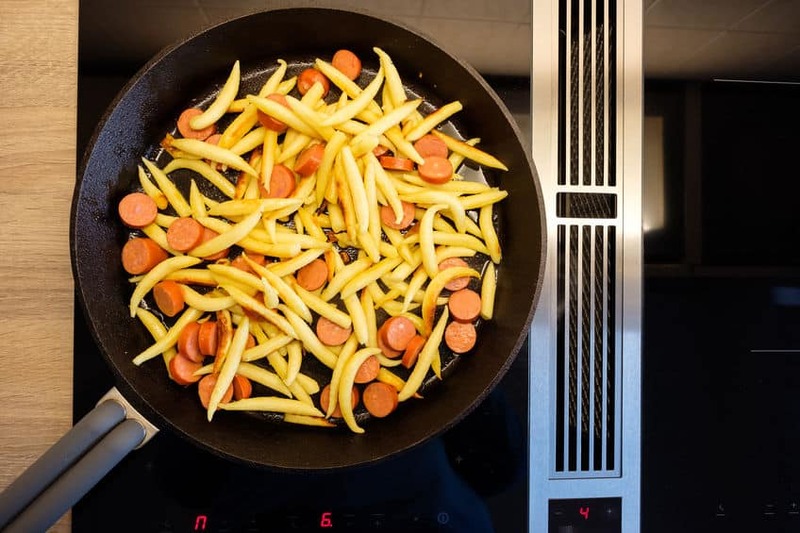 Disc-bottom induction cookware usually means that the bottom is made of thin magnetized stainless steel that has a conductive material such as aluminum or copper bonded to it. Not all disc-bottom cookware have layers that touch the edge of the vessel. This is problematic when using gas or electric stoves as the outer edge of the pan is going to be colder than the center. Disc-bottom vessels that do not produce good results are sauté pans or skillets. Some pots and pans are described as "bottom encapsulated with impact bonded aluminum". This means that pressure and friction and not adhesive is used to form the bond between the bottom of the vessel (stainless steel) and the disc (aluminum). The three layers of a pan could be: stainless steel, aluminum and stainless steel. Be sure to read the entire product description as sometimes the sides of pots and pans bonded with this method are only stainless steel. This is not necessarily bad, however, you want to know exactly what the construction of the vessel is that you are purchasing. 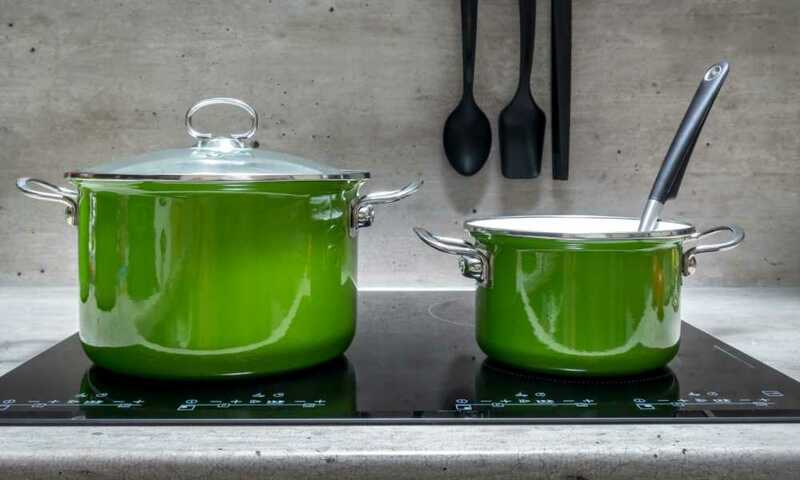 When you are shopping for cookware to use on your induction stove, keep an eye out for induction ready symbols on the base of the pot or pan. Remember to also bring a magnet so you can check. If you are purchasing cookware online, be sure induction compatibility is specifically stated in the description. This ensures that you will only select cookware that is compatible with induction stovetops.